New Member or Current Member? Learn about all of the benefits, programs and connections your chamber membership gives you. Not an Arlington Heights Chamber Member? We're here to help local businesses succeed. 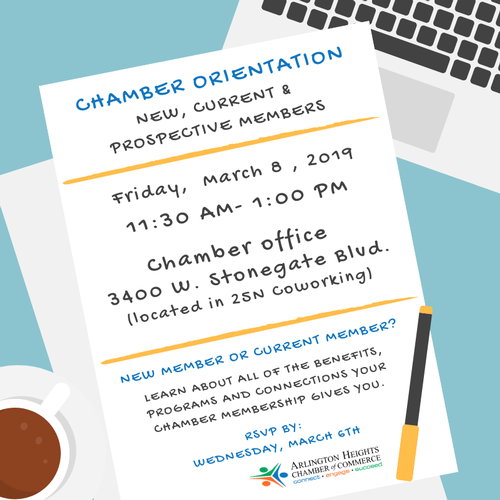 If you're looking to raise your business or organization's profile in the Arlington Heights community and get connected to the people and resources that can help you grow your business, join us for a free introduction to the chamber. You'll also get to meet other local business people and start networking right away. The chamber offers networking opportunities, advertising opportunities, savings programs, assistance with navigating Village of Arlington Heights procedures, business guidance and more. Lunch will be provided compliments of Corner Bakery. We look forward to seeing you at chamber orientation!